I am not a lawyer. I have never studied law. But I have been negotiating license agreements for our library for 8 years. Every library is a little different. Things to consider in a public library may be a little different than the concerns in an academic library. 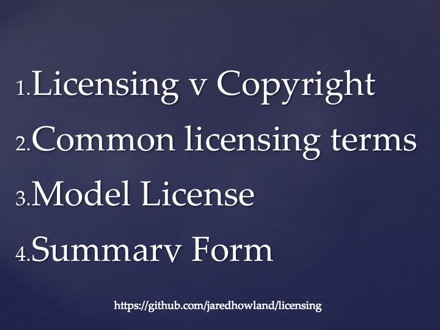 I want to talk about common license terms, show you some terms we are concerned with in an academic library, and hopefully teach you just enough about licensing that you can decide for yourself what may or may not be of concern in your particular situation. And every situation is a little different. There are some academic libraries where there is a University lawyer that must sign and approve all license agreements. As a librarian, you should still be aware of licensing issues though. You can even negotiate terms with the publisher or vendor before the license is sent to the lawyer. What lawyers are concerned about in a license are different things than librarians are concerned with. You work out terms most favorable from a librarian and patron perspective, and let the lawyers work out what is best to protect the University. Other times, there is someone in the library with authorization to sign license agreements. As you leave today, if you don’t know who this person is, you should probably go back and find out. You can talk to them about the things they look for while negotiating for a license. If nothing else, this exercise will help you know a little more about how your library works and what license terms to keep a really close eye on in the future. So, despite not being a lawyer, I can talk about possible problem clauses in license agreements. And that’s what I will be doing today. 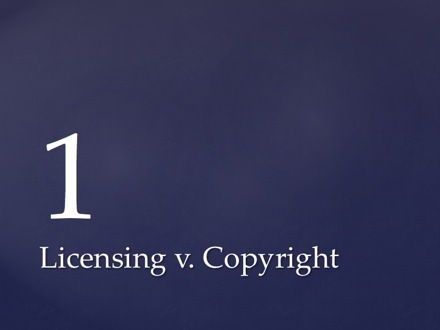 Let’s start with a discussion of licensing versus copyright. Copyright extends certain rights to you and your patrons. Copyright largely dictates how you can and cannot use materials under copyright. These rights can either be expanded or restricted with a license agreement. The first thing I would like to point out is that you can negotiate anything in a license agreement. If you are going to be negotiating a license agreement, it is important that you have at least a rudimentary understanding of what rights you have by default—through copyright and the fair use doctrine. This way you are more likely to recognize when a license agreement is perhaps too restrictive. I’m not covering that here because I am no copyright expert and I rely heavily on my University’s Copyright Office to guide me. 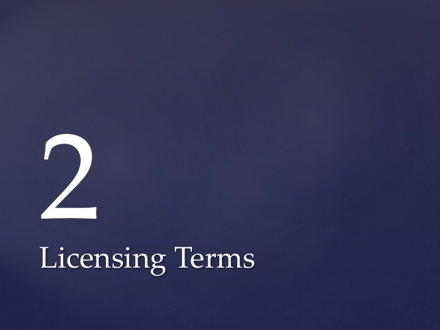 So, with that out of the way, let’s talk about some common licensing terms found on the handout coming around right now. So let’s talk about a couple of tools that can be helpful as you negotiate access to business resources. The first is the model license agreement. This is a license agreement created by a community of librarians and publishers seeking to create a license that is mutually beneficial to both parties. It is simply an example or template agreement that can be used to help you judge a good agreement from a less good one. If you are negotiating a license and don’t like a clause, you can refer to this document and lift language from it to suggest as replacement language in the license are negotiating. 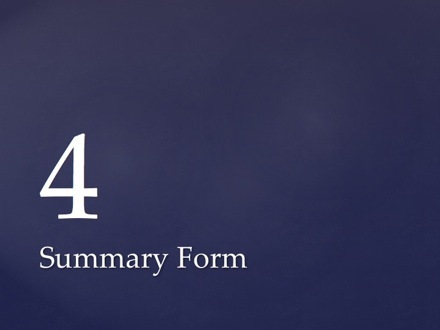 Another helpful tool is what I have called a summary form. As you read through a license agreement for the first time, it can be helpful to have a form similar to this one to fill out. 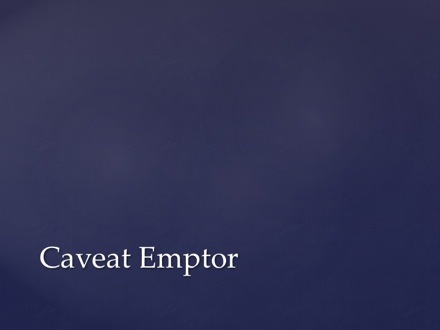 This allows you to quickly identify areas that need to be negotiated. After the license is negotiated, it reduces the need to refer back to the actual agreement to answer basic questions about a specific license. It also makes it easier to put key terms of the license into an ERM system. One principle of license agreements that should be understood is that if a breach of license ever ends up in court, a judge is asked to use his or her judgement to interpret license terms. License agreements can explicitly or implicitly allow or prohibit certain actions. Sometimes agreements do not mention a clause at all and are silent on an issue. In those cases, you fall back to your default rights and reasonable expectations of usage. This form makes you interpret the intent of a license agreement to some degree. As long as you can make a reasonable argument for why you interpreted a license a certain way, it should be defensible in a court of law. Again, I am no lawyer, but that is the gist of it as I understand it. 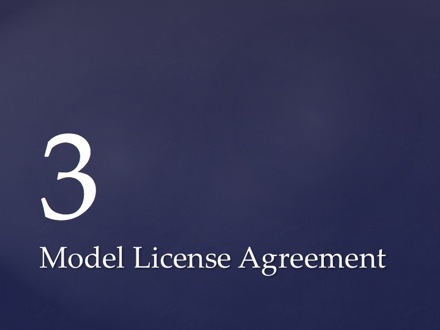 So I have handed out a license agreement from ProjectMuse as an example license. On the back page, I have filled out a summary form for that license as I interpreted it. There are some right and wrong answers, but by and large, it all comes down to how you interpret a license agreement and will probably vary from person to person and from institution to institution as to how you choose to interpret an agreement. Again, as long as you can show your interpretation to be a reasonable one of license, you should be fine. I have never heard of a publisher taking a library to court over one of these agreements, but as you negotiate you must think as though that is a possibility and arrange for the best terms possible. So, I thought we would spend a few minutes practicing interpreting a license agreement. I have handed out a generic agreement for Business Source Premier with a blank summary form on the back of that handout for you to fill out. I want to give you about 20 minutes to get into groups of 2 or 3 to read through the agreement and fill out the summary form together. 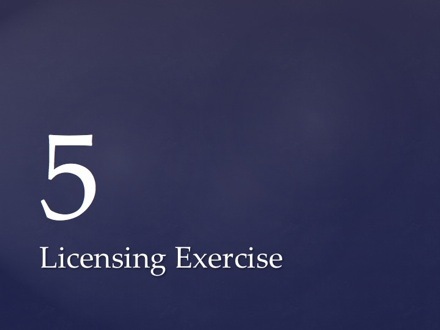 After that, if we have time, we can go over the license and talk about ways you interpreted the license.